Judge Karen O’Connor discharged the jurors and thanked them for their attendance this morning. 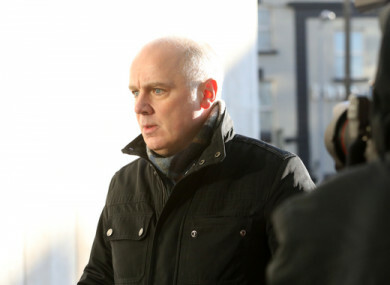 A NEW JURY has been empanelled this afternoon in the trial of former Anglo Irish Bank Chief Executive David Drumm. Today Judge Karen O’Connor discharged the former jury due to a difficulty that had arisen and thanked the members for their attendance at Dublin Circuit Criminal Court. Mr Drumm (51), with an address in Skerries, Co Dublin, has pleaded not guilty to conspiring with former bank officials Denis Casey, William McAteer, John Bowe and others to defraud depositors and investors at Anglo by “dishonestly” creating the impression that deposits in 2008 were €7.2 billion larger than they were. He has also pleaded not guilty to false accounting on December 3, 2008 by furnishing information to the market that Anglo’s 2008 deposits were €7.2 billion larger than they were. Under the Juries Act, an expanded 15 member jury can be empanelled if a trial is expected to last over two months. Judge O’Connor informed the court prior to swearing the new jury that Mr Drumm’s trial would last five months. It took two hours to swear in a fresh jury of eight men and seven women. Four jurors were discharged after taking the oath while the jury was still being sworn in. Earlier, Judge O’Connor gave strict warnings to the jury panel that a person must not serve on the trial if they had ever been employed or held shares in Anglo, Irish Life & Permanent, Irish Life Assurance or Irish Life Investment Managers. She said a person must not serve on the jury if they had strong views on Anglo or if they had expressed anything to do with the bank, bankers or banking crisis on social media. Judge O’Connor also warned that any research conducted online might collapse the trial at enormous expense. The judge told the jury panel members that they were not allowed to use the internet, communicate electronically or talk to anyone outside the jury room about the case. The trial continues tomorrow morning before Judge O’Connor. Email “New jury empanelled in David Drumm trial ”. Feedback on “New jury empanelled in David Drumm trial ”.